Sepp Blatter and Michel Platini will learn if they are banned from football when Fifa's ethics judge delivers verdicts against the pair on Monday. Fifa's ethics investigators want both president Blatter and his Uefa counterpart Platini to have life bans. But speaking to Swiss newspaper Blick on Sunday, Blatter said the corruption charge against him had been dropped. A spokesman for Hans Joachim Eckert, Fifa's ethics head, declined to comment. Blatter, however, faces other charges, including mismanagement. Both he and Platini have denied any wrongdoing, and insist they have not breached Fifa's code of ethics. The case against them revolves around a £1.3m "disloyal payment" made to Platini in 2011. 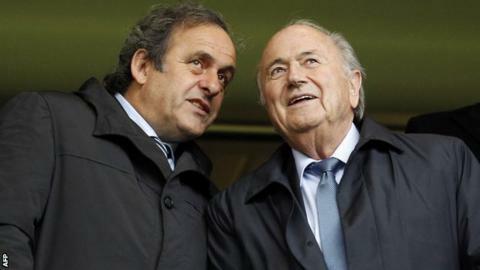 Both men say the payment was part of an agreement made for work carried out between 1998 and 2002 when Platini was employed as an adviser for Blatter. That payment was not part of Platini's written contract - with Blatter saying recently the pair had a "gentleman's agreement" for an additional amount of money to be paid. The timing of the payment - some nine years late - has also come under scrutiny. That money was paid while Blatter was seeking support for a fourth term as president and facing a major challenge from Qatar's Mohamed Bin Hammam. Platini subsequently endorsed Blatter for the presidency. Eckert held personal hearings for the pair last week - which Platini boycotted. The German judge is scheduled to announce his findings and any sanctions on Monday morning at 09:00 GMT. BBC Sport understands that sanctions previously handed down to other Fifa officials will likely provide a benchmark in the Blatter and Platini case. In July, Harold Mayne-Nicholls, the official who headed the inspection team assessing bids for the 2018 and 2022 World Cup, was banned from all football-related activity for seven years for conflict of interest and breach of confidentiality. Any guilty result will have major consequences for both Blatter and Platini. Appeals against the decision can be made, but Platini's hopes of running as a candidate in the upcoming Fifa presidential election would suffer a potentially fatal blow. He can only stand if cleared of the charges against him. Meanwhile, Blatter would be denied his wish to leave Fifa on his own terms and would exit instead in disgrace. He has expressed a wish to attend the 26 February congress in Zurich, where his successor will be appointed, in order to say farewell to the organization he has lead since 1998. Any hope from that he would leave quietly if banned also looks forlorn. The 79-year-old has scheduled a press conference, symbolically at Fifa's former headquarters in Zurich, on Monday morning. Blatter has expressed his belief in recent weeks that only Fifa's 209 member nations - and not the ethics committee - can remove him from office.